The fiery country of Argentina has a lovely state flower perfectly suited for the passionate nation. The Erythrina Crista-Galli, or ceibo, is the national flower of Argentina and it’s a graceful representation of the Latin nation. Ceibo flowers are truly the blossoms of the Erythrina crista-galli tree. In England the tree is known as the Cockspur coral tree. Ceibo is a flower native to Argentina and to other countries in this region of South America. A country with a history of political upheaval and astonishing beauty, the government did well to find such as lovely specimen to name as the national flower in 1942. Bright coral blossoms drape gracefully on a single stem. The solitary blossom is tall, elegant and graceful in its simplicity, much like a red lily might be. There are four petals on the ceibo flower. Two of the petals are so tiny, they are barely visible. These are called the wings. The remaining two petals are large and often partially joined to make a long narrow vase of orange or red. The ceibo flowers bloom between November and February, growing on the branches of the Erythrina, a South American native tree with a crooked trunk. Argentina is considered one of the best places in the world to grow flowers with an ideal climate. 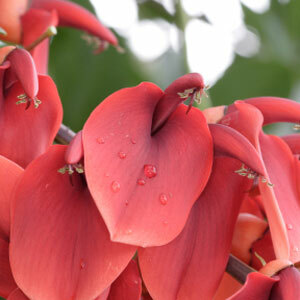 The Erythrina Crista-Galli grows naturally near water such as swamps and wetlands, and is also commonly cultivated in urban settings thanks to its fiery colors. If you’re hoping to grow your own Erythrina tree to enjoy the ceibo flowers, you’ll need slightly acidic soil and plenty of sun. Soak seeds for the tree for twenty-four hours before planting or transplant a seedling to include the tree as an ornamental in your own garden. Once established, the tree needs minimal care. This entry was posted on Wednesday, November 4th, 2009 at 6:46 pm	and is filed under National Flowers. You can follow any responses to this entry through the RSS 2.0 feed.